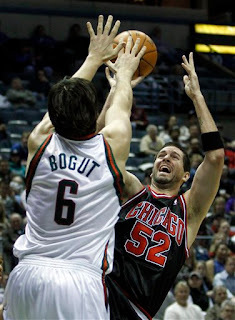 Bogut Blocks Bulls from Win ~ The Bucky Channel - The World of Sports from Wisconsin's Perspective. Guess who's back, back again. Yes folks, Andrew Bogut was back in uniform tonight for your Milwaukee Bucks. After being out for six games, Bogut returned for a huge Central match up against the Bulls. There's no doubt about it, the Bucks really look a lot better with Andrew in the line-up. However, even with Bogut out there, the Bucks put too much stock into the outside shooting game. Milwaukee finished the game 10-26 from downtown, and they only got to the free throw line 21 times making just 11 of them. This was enough tonight for the Bucks, but in the long run they really need to start working the ball down low. Especially with Bogut back in the starting five. The game against Chicago was pretty back and forth during the first half. The Bucks held a four point lead at halftime, but just like the last time they played the Bulls, you had to figure the Bulls would come out firing in the second half. But Monday was a bit different, as the Bucks came out firing after halftime. At one point in time in the third quarter, Carlos Delfino had 11 straight points for the Bucks. He did that with three 3's and a tip in to give the Bucks a nice lead. Jennings also hit a huge 3 to give the Bucks a 15 point lead in the third quarter. But only the Milwaukee Bucks could find a way to blow that lead, and they did. Coincidentally, as this happened while Bogut was on the bench. Thanks to the comeback, the Bulls took the lead again in the 4th quarter, their first since they had lead 3-2. With just over three minutes to play, it was the Bucks that found themselves down 89-87. After the past few games getting beat late, I thought this was going to be another late defeat. I thought for sure that would be the case after they even showed pregame interviews about how the Bucks needed to close out games, something I thought was nothing but a poorly timed jinx. Milwaukee did try to blow it late by not getting a rebound and allowing John Salmons to hit a three towards the end of the game. Jennings was promptly fouled on the inbound, and thankfully he would make both his throws to give the Bucks a three point lead. Continuing the back and forth style of play we saw early in the game, Derrick Rose came back down and cut that lead to one. In response, Charlie Bell made only one of the free throws to give the Bulls a chance to tie it. Another crushing Bucks loss was bound to happen, right? Chicago was given their one last chance to win it or tie it. If you're the Bulls, who would you give the final shot to? Well, the Bulls put it in the hands of Brad Miller, and he was wide open. Miraculously, he left it short. Lets take a look at some highlights from this 99-97 win for the Bucks. * Andrew Bogut did some things Monday night at the Bradley Center in front a loud Squad Six. Bogut finished the game with 22 pts, 15 rebs, 4 blks, and 3 stls. This was an easy choice for the Bucks POTG Monday. One of his four blocks came late in the game against Luol Deng that kept the Bulls from tying the game. * Ersan played well again tonight with 13 pts, 8 rebs, and a plus 21 +/-. His only downfall was he fouled out for the first time this year. He gets in foul trouble a lot so lets hope he can keep this number down. Going to Europe to play ball has paid off well for him. * All 5 starters scored in double figures tonight. * Loul Deng, who killed the Bucks in the first match up, had a good game. He finished the game with 22 pts, 14 rebs, and 5 turnovers. He also made all eight of his free throws on the night. This will earn him what I think is his second Hunter of the Night. The only thing different about this one is we won the game this time. Overall, it was a good win for the Bucks especially after dropping four straight games. The Bucks will travel on Tuesday for a Wednesday night game against Washington. The Wizards are coming off an embarrassing defeat to the Bobcats, as they only put up 76 points so the lets hope the Bucks can keep up the good work on the defensive end. After the win Monday night the Bucks will sit at a record of 9-7, which puts them at second in the central. Something I'm not sure would have happened without the return of Andrew Bogut.